By Dr. Jason Lemieux, Chiropractor, Physiomed Oakville Most of us understand the importance of warming up before a round of golf. That doesn’t stop us from showing up to the course five minutes before our tee time, running to the 1st tee, and grabbing the driver for a couple of practice swings to “loosen up”. We then jump right into the round, usually with less than ideal results.Warm-ups don’t have to take long to be effective. If you focus on a few important physical factors, you can make those five minutes before the round really count. 1. A warm up should actually warm you up. Try to raise your body temperature by doing even 30 seconds to one minute of light activity. This will raise your heart rate slightly and increase your body temperature. A brisk walk through the parking lot, light jog, jumping jacks or anything to get your blood pumping will help loosen your muscles and make stretching and swinging the club much more comfortable. Small arm circles forwards and backwards with your palms facing up, forwards, and down for just 10 to 20 seconds will get your shoulders ready to move. Here’s an easy stretch to reinforce a proper spinal angle at address and get those hamstrings loose. Place a club behind your spine and put one foot on a low bench or step. Lean forward from your hips slightly, keeping your back perfectly straight. 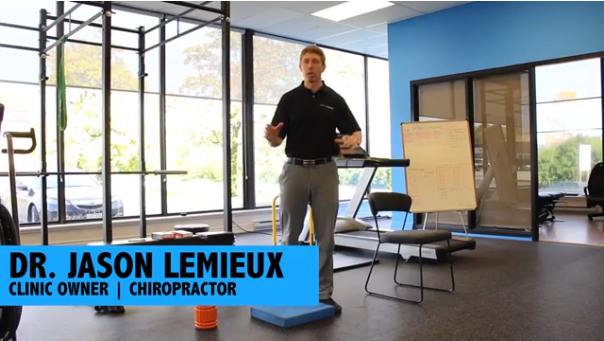 You won’t have to move far to feel a big stretch in your hamstrings. Hold for 10 to 15 seconds each side. Get into a half kneeling stance, keeping your spine tall and long. Gently tilt your belt buckle up towards the sky, flattening out your back. Now translate your body forward, maintaining that neutral spine. You should feel a good stretch into the front of your downside hip and thigh. Stretching the hip flexors will relieve pressure on your spine and give you a more neutral pelvis and spine angle. Using the same straight spine forward bend, reach across your body to grab either a golf cart or stable post. Place the hand closest to the post above the first hand and gently pull with the bottom arm as you push with the top arm. Gently ease into this stretch as you’ll be creating the maximum separation between your upper body and lower body. This stretch will help create more shoulder turn in your swing, freeing up your movement for more consistency and distance. That entire circuit should take all of three to five minutes to complete and will help warm up the most common areas of tightness on most golfers. For more information on how improving your health can improve your golf swing, book an appointment at a Physiomed clinic near you.